We offer special benefits to students from partner institutions. Current students, graduates, and employees of partner institutions enjoy special tuition discounts at Excelsior, along with fee waivers, coordinated course sequences (articulation agreements), and other benefits. We provide a rigorous education. Don’t confuse us with our for-profit competitors. Excelsior is a Middle States accredited, nonprofit institution, with top-notch faculty and academic degrees that make a real difference in the job market. Our graduates compete on equal terms with graduates from traditional four-year schools. We specialize in educating working adults and other nontraditional students. A national leader in adult education for more than 40 years, Excelsior caters to students who need to balance education with jobs, families, and other responsibilities. Our innovative online learning model lets you take courses where and when it’s convenient for you. We accept more transfer credits than other colleges. Excelsior will accept up to 105 transfer credits from accredited institutions. We also grant credit for military service, professional training, credit by examination, and many types of real-world experience. Excelsior College grants bachelor’s degrees in more than 30 different fields of study. Excelsior offers more than 14 business and technology degrees, including business, accounting, nuclear technology, computer technology, and cybersecurity. Excelsior’s bachelor’s degrees in health sciences equip graduates to become leaders in a dynamic industry. Excelsior offers multiple degrees in Liberal Arts. Our general Liberal Arts degree is your shortest, straightest path to a degree. A national leader in nursing education, Excelsior is recognized for excellence by the National League for Nursing, a preferred membership organization for nurse faculty and leaders and nurse educators. Excelsior offers multiple degrees in Public Service including criminal justice and military studies. Because we cater to working adults and nontraditional students, Excelsior College strives to make our programs affordable to everyone. That’s especially true for students who come to us from partner institutions. Excelsior’s educational partnerships offer significant discounts on tuition and student fees. All Excelsior students save money, thanks to our generous credit-transfer policies. We can accept up to 105 of your students’ previously earned credits, so they’ll take—and pay for—fewer Excelsior courses and credits as they complete their bachelor’s degree. 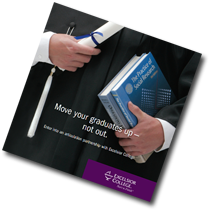 Many of our transfer students only need to take a handful of courses from Excelsior to graduate. Excelsior’s financial aid advisors will work with your students to obtain all the forms of support they’re eligible for, including grants, loans, scholarships, and GI Bill tuition assistance. We also offer flexible payment plans and budgeting assistance to help keep their education affordable. In addition, your employees or members may be eligible for federal and New York State loans, as well as grants, scholarships, GI Bill® tuition assistance, and other forms of financial support. Excelsior’s financial aid advisors will work with your employees or members to obtain all the forms of support for which they are eligible. We also offer flexible payment plans and budgeting assistance to help keep your employees or members education affordable. Please note that the partnership benefits apply to all associate, bachelor’s, and master’s degrees, excluding the Associate Degree in Nursing program. Excelsior College is a regionally accredited, nonprofit distance learning institution founded in 1971 focused on providing educational opportunity to adult learners. The College contributes to the development of a diverse, educated society by valuing lifelong learning with an emphasis on serving individuals who are historically underrepresented by higher education. Excelsior meets students where they are—academically and geographically—removing obstacles to the educational goals of adult learners through affordable access to quality instruction and the assessment of learning. Our pillars include innovation, flexibility, academic excellence, and integrity.